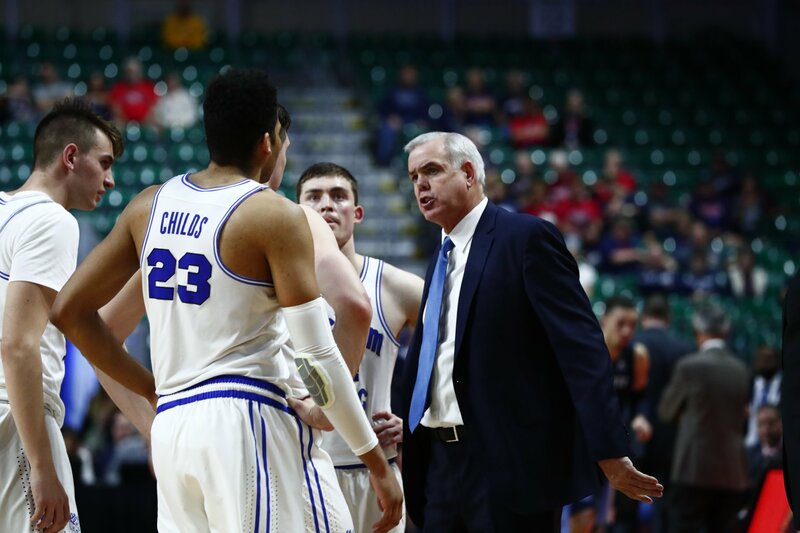 LAS VEGAS – The BYU men’s basketball team topped San Diego 85-79 in the quarterfinals of the West Coast Conference tournament Saturday afternoon in the Orleans Arena. Elijah Bryant led the offense with 27 points, shooting 10 of 13 from the field. He also grabbed four rebounds and two steals. Yoeli Childs scored 22 points and added eight rebounds, two assists and one steal. TJ Haws contributed 13 points and three assists. McKay Cannon came off the bench to lead the team with five assists. The Toreros started the game with consecutive 3-pointers to take an early 6-2 lead. After a jumper by Childs, San Diego extended its lead to 11-6 with 15:13 on the clock. A pair of free-throws by Dalton Nixon brought the Cougars within three, 13-10, but was quickly answered with another Torero trey and two points from the charity line for an 18-10 San Diego advantage with 13 minutes to go in the first half. BYU went on a 9-0 run with 10:28 remaining and was led by Bryant, who scored six points in the streak. The Toreros ended the run with a basket of their own but were unable to slow down Bryant who scored once again on the other end of the court, giving the Cougars a 21-20 lead. A steal by Cannon led to a basket by Nixon to tie the game at 31-all with 4:40 remaining on the clock and was the start of a 6-0 run. In the final minute of the first half, Childs grabbed a steal and finished with a dunk to give BYU a 39-35 lead at halftime. After one half, the Cougars shot 48.3 percent from the field and held San Diego to 39.1 percent. Despite BYU being on top at halftime, the lead changed 11 times in the first half. The second half started with a 10-5 run for the Cougars, including six points by Bryant, to give BYU a 49-40 lead with 16:30 on the clock. A Torero basket from beyond the arc snapped a 6-0 run by the Cougars but was quickly answered on the other end of the court with a trey by Bryant, keeping the lead at nine-points and starting another run by BYU. Childs hit a jumper and was followed by back-to-back 3-pointers by Bryant, extending the run to 11 points and the lead to a game-high 17 points at 60-43 with 11:42 remaining in the game. San Diego went on a 12-0 run to tie the game at 71-all with under four minutes to go. Luke Worthington’s pair of free-throws ended the run and put BYU back on top. In the final minute of the game, free-throws by Haws and Jahshire Hardnett gave the Cougars a six-point lead, 79-73. The Toreros converted on a three-point play to make it a one-possession game. 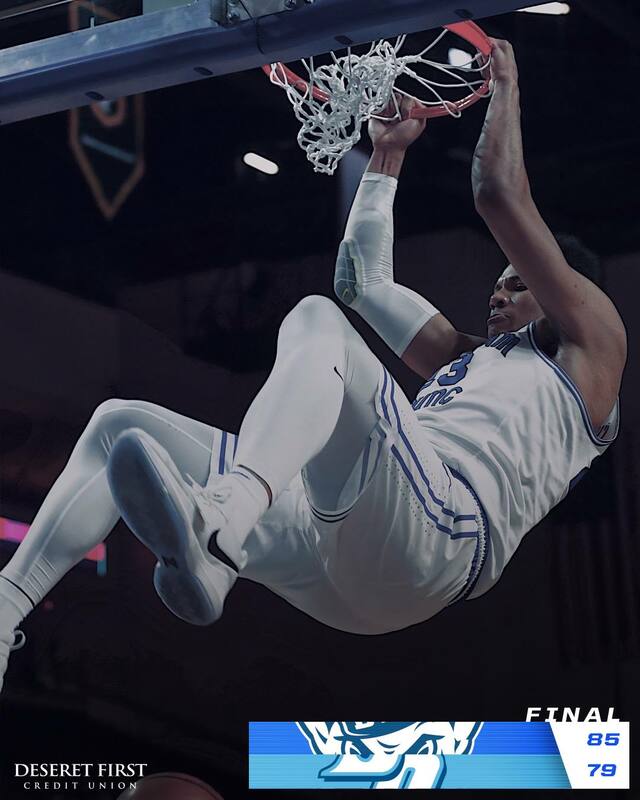 In the final seconds, Childs finished a pair of free-throws and slammed home a dunk to secure the 85-79 win over San Diego. At the end of the game, BYU shot 51.8 percent from the field, 27.3 percent from the three and 75.0 percent from the line. The Toreros shot 46.8 percent from the field, 37.0 percent from beyond the arc and 78.1 percent from the charity stripe. Defensively, the Cougars forced 14 turnovers. BYU will play the winner of Saint Mary’s and Pepperdine in the semifinals on Monday, March 5. Game time will be announced following tonight’s quarterfinal games. Monday’s game will be available on an ESPN platform and audio broadcasts can be heard on BYU Radio (Sirius XM 143), BYU Sports Network and Easy 101.5 in St. George. Elijah Bryant shot 10 of 13 from the field for 27 points, his 12th 20-point game of the season and 28th game scoring in double figures. Bryant hit three 3-pointers, his 24th game this season hitting multiple 3s and 15th with three-plus 3s. Bryant’s 81 3-pointers on the season are eighth all-time in a single season in BYU history and his 15 games with three-plus 3s are tied for eighth. Yoeli Childs finished with 22 points and eight rebounds, his 31st game scoring in double figures and 12th 20-point game. TJ Haws totaled 13 points and three assists and hit 7 of 8 from the free-throw line. McKay Cannon totaled four points, five assists and two steals off the bench.